From Calais, we drove a very picturesque road along the coast to Wimereux (with a diversion to avoid Sangatte which we obeyed on this occasion!). I noted, for future reference, that we passed a very beautiful looking golf course just outside Wimereux. When we arrived at the Hotel Atlantique we were greeted by Susie and Quentin. Tom and Carole’s Ulster saloon was already there so, of course, we parked our car next to its twin. The hotel denied all knowledge of the Whattons, so leaving Rowley to his beer, Susie, Quentin and I walked along the beach taking in the wonderful ozone. On our return, Rowley was still having a beer but he had found the Whattons! We all had a superb fish meal in the hotel that evening, which included oysters for Rowley, and a few bottles of wine. We travelled in convoy through northern France avoiding the main towns and had a light lunch in Songeons and arrived, in glorious sunshine, at the Hotel du Lac at 6ish where we met up with the rest of the Talboteers who had travelled from Le Havre. It was great to see everyone again and have a “catch up” over a G & T or two before dinner. Daryl was the only one fettling his Sunbeam - something to do with a leak - however he was receiving help and advice! Rain as per forecast! What to do! Mon Dieu! After much deliberation we opted for culture. 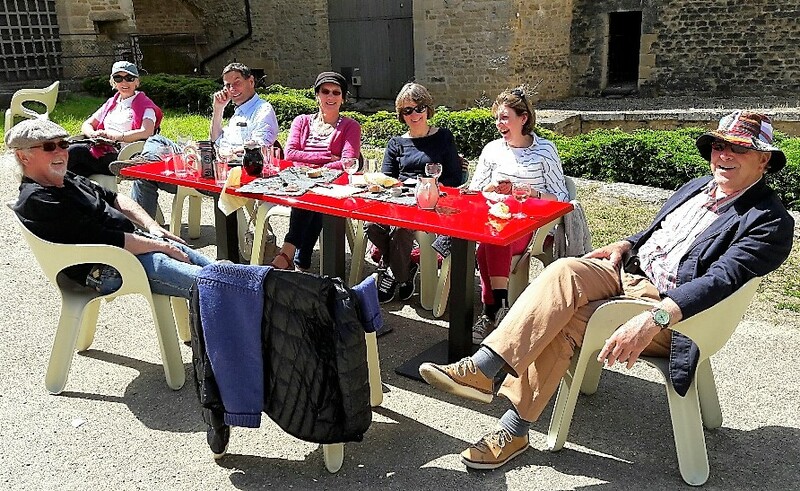 We set off in Tom’s immaculate Ulster and visited Le Petit Moulin at Cernay where we learnt about the artists from the Barbizon school and other schools who came to that valley to paint, and that there was an Exhibition of Albert Rigolot’s work at the Abbey. We found a very lovely hotel in the Abbey gardens where we had tea before visiting the Exhibition. Others in the group ventured by train to Paris where they enjoyed a good lunch and an impromptu tour by Quentin. However, Sally and David opted for cycling along the Champs Elysees! In the evening we had Kir and nibbles before a splendid dinner at the hotel, which could have been mistaken for the Gala dinner that was scheduled for the following evening! Race Day! 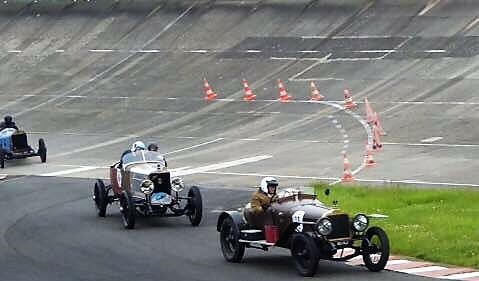 The atmosphere at Montlhéry was terrific even though it was very cold. We were able to walk round all the paddocks and inspect the cars without any red tape. The old bikes with their riders in costume mingling amongst the crowds were fun. 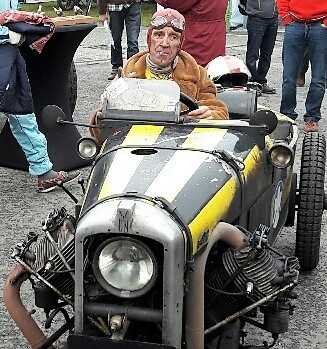 We watched Robert Frankcom race his Edwardian Talbot which he had driven from England - and then he was going to drive it home that evening! As it was so cold, we left fairly early to warm up with tea at the hotel where Richard Newby was busy dismantling his carburettor. Trevor diagnosed “heavy float” and, luckily, Richard had a spare, so the problem was solved. 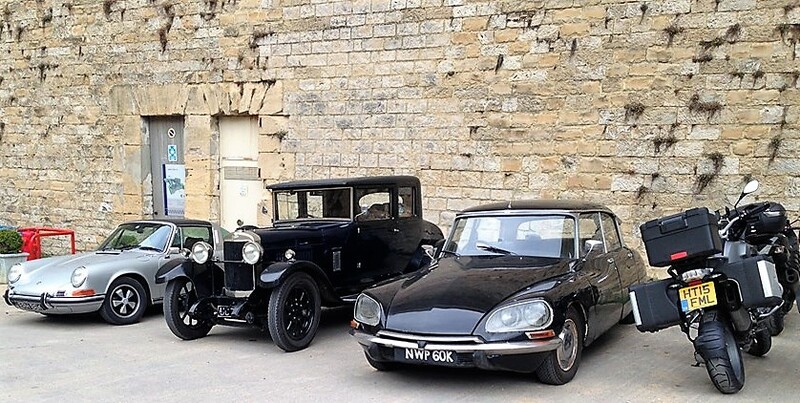 Tom’s car had developed an electrical problem and wasn’t charging, so with help from other Talboteers was provided with a charger and extension lead which was attached to the hotel’s outside light! The no. 2 Gala dinner was a great success with cocktails, followed by a most delicious buffet and the occasion was marked by Rowley sporting his TOC tie! On leaving Hotel du Lac we skirted Paris and journeyed through the Champagne vineyards and gradually inclined to the Ardennes with its stunning views. We found Sedan with ease; however, finding the hotel entrance tested one’s will to live! Many of us circuited the Fort many times - David who had cycled from Vouziers about 50 kilometres away went straight to it (but he did have to suffer an extremely bumpy canal path on the way!). That evening we dined at the hotel, but unfortunately several of us suffered dire consequences!!! A beautiful sunny day! Most of us visited the ramparts and the excellent museum adjacent to the hotel (for obvious reasons for me it was imperative to be close to the facilities of the hotel at all times! ), however, our intrepid cyclists, Sally and David toured the Ardennes. Dinner that evening was at the hotel, but we chose very carefully what we consumed! A very lovely drive through the Ardennes with spectacular views through Belgium and then on to Maastricht. The only drawback being the closure of the exit that we needed to take from the motorway to enter Maastricht. This involved, in our case, quite a substantial detour! We finally made it to the hotel and dropped our luggage off before taking the car to the underground car park nearby. This was not an easy task apparently - scanning the ticket proved tricky and, even trickier for one member of our group, was getting through the barrier quickly enough! The hotel was really quite quirky with its décor and fun - apart from carrying one’s luggage up two flights of narrow wooden stairs! Onno very kindly led us to a local restaurant where we had a most delicious meal (yes, more asparagus) and we were joined by Emile who was on great form. Another day of sunshine! In the morning Emile and Louis kindly arranged a walking tour of the old town with its narrow cobbled streets, churches, parks, water mill and city wall. Cyclists were everywhere and at quite a speed, but we did find it a vibrant and exciting city. In the afternoon Rowley attended to his brakes and I toured the town with Chrissie and Trevor, avoiding the thunderstorm in the most amazing hat shop! In the evening we were taken to another restaurant selected by our friends and we were joined by Emile and had the best meal of the holiday! After much trepidation we all managed to exit the garage without any problems - that is, after we had mopped up any oil spillages. However, a few hundred yards further on, we encountered Trevor and Chrissie, stationary and bonnet up. We stayed to offer any assistance we could and to offer moral support as did Clive and Caroline. Apparently petrol was leaking on the magneto and Chrissie was not happy with the black smoke around her feet! Eventually the problem was sorted with Clive’s gasket goo on the petrol tap. There was much more traffic on the Dutch roads and we actually saw some old windmills. Surprisingly we found the hotel with great ease - there it was straight in front of us overlooking the canal and lake. Roman and Helen had arrived at the hotel first and were sitting in the sunshine with drinks and large smiles on their faces. 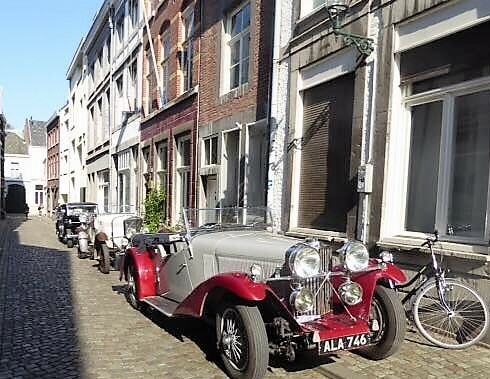 They had left Maastricht early to get their Porsche fixed as it was not firing on all cylinders and the garage had succeeded! We had an excellent dinner all together that evening and Sally presented David (our leader) with a very special bottle of Pinot Noir and thanked him for arranging the most splendid trip that we had all enjoyed. We had an emotional goodbye with everyone and left for the lunch time ferry from The Hook. We took the motorways all the way to the port but were able to have a coffee on the beach before departure. The crossing was very smooth and we were home by 9pm. A wonderful holiday, thank you TOC.